*I have prices set to CAD, so this deck can still be bought for just over $100 USD. In the early turns, you want to be making all your colors active ASAP, plus making a few creature drops (if you land t1 Permeading Mass, into t2 Stormchaser Mage or Assault Formation, you're doing well!). 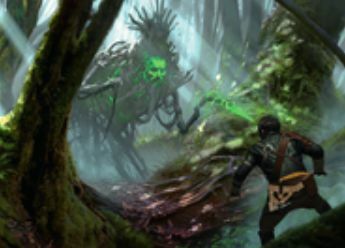 After about turn 3-4, depending on the speed your able to play at, you want to be holding Sidisi's Faithful's and Void Grafter's as often as possible, so you can remove a blocker, or protect from some kill spells. Permeating Mass is a cute creature because he forces your opponent to think about blocking with stronger creatures. If they do, and they're dude survives... Well suddenly it becomes a Mass itself! Now while that may not seem scary, lets look at someone blocking with Avacyn.. Suddenly if the opponent has a non angel die... the Permeaded Avacyn DOESN'T flip. Now, you combine the 1/3 for G with... Oh I don't know... Assault Formation... And suddenly we have lots of problems for the opponent. Now our 1 drop is capable of dealing 3 damage on t2 and so on, plus if we have anything that survives it's relentless assault, IT turns into a stupid Mass itself! Red was almost not needed, but I found with some matches having Fevered Visions out was deadly, plus... Stormchaser mage later on doing 3 damage+ is pretty great! Fiery Impulse is obviously great removal as well. Fevered Visions actually helps us as well with the flash creatures plus few counterspells we have (Clash of wills with flash creatures is nice!). Arlinn Kord is a bit off for the list... but I found her really useful (though could easily be moved to sideboard, and put the Meddlers main), not only does she make blockers (and potentially bolt stuff after flipping), but she can auto pump dudes! Between her and Assault Formation pumps, we can almost overpower any creature in the format! Sideboarding is straightforward for the most part, though theres a few cards I'll mention: Ongoing Investigation I liked ideawise for the main, but I found it being less helpful after adding Fevered Visions. So to he sideboard it went for facing grindy creature decks (drawing cards helps alot). Another notable card is the Aligned Hedron Network, and I've been testing it for the Ramp / Midrange decks. None of our dudes will ever be bothered by it, but if we're facing down Emrakul's... well we need help. Mizzium Meddler is good to take certain removal away from more important creatures, or even in respond to a Reflector Mage trigger! Thats all this week folks, I hope you enjoy the Under $150 Standard Temur Assault Formation deck, just some added fun before it rotates!